Like Google, Samsung, Motorola, and others before it, HTC long ago discovered the virtue in separating core apps from firmware. Following the decoupling of the Sense 6 lock screen and the Gallery app, the Taiwan-based company has begun to distribute HTC Weather through Google Play. The function of HTC Weather is, as you might have guessed, to provide succinct and useful forecast information. Should you need to know the chance of precipitation, temperature, or any other number of meteorologic statistics for a given hour or day of the week, the app will no doubt assist. 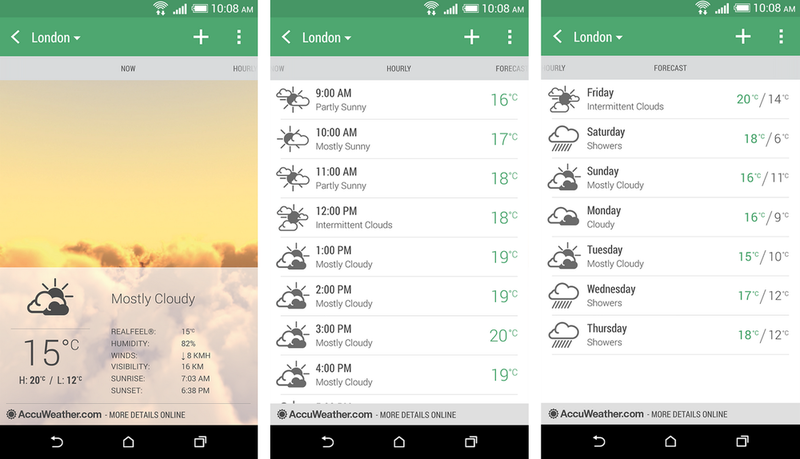 Unsurprisingly, HTC Weather is only compatible with a select few, HTC-made phones. You will not necessarily be missing out if you cannot use it, though; the app pulls data from AccuWeather, so getting an identical report is as simple as downloading the official AccuWeather application.